MagPul MS2 Multi-Mission Sling » Protective Solutions, Inc. The MagPul MS2 sling is unmatched for its versatility, offering shooters the option of using the sling in single point or 2-point fashion. The MS2 is rapidly convertible from a single point configuration that is useful for quick firearm deployment and maneuverability, to a more stable 2-point configuration for precision shot placement. 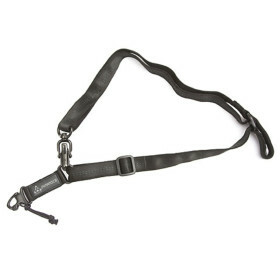 Additional features include an adjustment loop that allows for single-handed sling tension management, a quick-detach lanyard, and positive-locking metal hardware. Available in Black. Rear: Compatible with most loop-style end plate sling adapters. Front: Compatible with most full sling swivels and loops for 2 point use.